From the creator of the sensation Postmodern Jukebox--with millions of fans globally--comes an inspirational memoir about discovering what you love and turning it into a creative movement. With student loan debt piling up and no lucrative gigs around the corner, Scott Bradlee found himself in a situation all too familiar to struggling musicians and creative professionals, unsure whether he should use the little income he had to pay his rent or to avoid defaulting on his loans. It was under these desperate circumstances that Bradlee began experimenting, applying his passion for jazz, ragtime, and doo wop styles to contemporary hits by singers like Macklemore and Miley Cyrus--and suddenly an idea was born. Today, Postmodern Jukebox--the rotating supergroup devoted to period covers of pop songs, which Bradlee created in a basement apartment in Queens, New York--is a bona fide global sensation, having collected more than three million subscribers on YouTube while selling out major venues around the world and developing previously unknown talent into superstar singers. From its Etta James-inspired rendition of Radiohead's "Creep" to its New Orleans jazz interpretation of Meghan Trainor's "All About That Bass," the group has established a sound like no other, crafting hits as exquisitely sublime as they are humorously absurd. But it wasn't always as easy as the YouTube videos make it look. As he worked to establish Postmodern Jukebox, Bradlee struggled through the obstacles that every self-employed artist or entrepreneur with a vision faces: how to collaborate successfully on teams with divergent visions, how to outrun the naysayers, how to chase the next innovation when your reputation makes others start to pigeonhole you, and so many of the other challenges lining the path to success. Taking readers through the false starts, hilarious backstage antics, and unexpected breakthroughs of Bradlee's journey from a lost musician to a musical kingmaker --and presenting all the entrepreneurial insights he learned along the way--Outside the Jukebox is an inspiring memoir about how one musician found his rhythm and launched a movement that would forever change our relationships to our favorite songs. Scott Bradlee is a pianist and musical arranger. His musical collective, Postmodern Jukebox, is best known for its viral "pop music in a time machine" covers and has performed in over 400 live shows in five different continents. "Candid, hilarious, and wildly fun, Outside the Jukebox is the book I wish I'd had when I was getting my start in theatre." "Bradlee found tremendous success by going his own way, and he turned his passion into a creative movement....I am learning from this read!" "Bradlee's story is a crash course on how to launch a monster career in entertainment." "Scott Bradlee may just be the most creative musician turned entrepreneur I've had the honor to work with. Read this book and you will be inspired to chase your dreams the way he has." 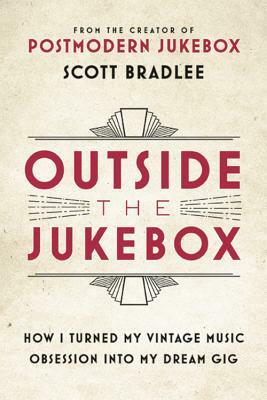 "With an uncanny ability to tap into the cultural zeitgeist time and again, Scott Bradlee has given rise to a whole new crop of mega-talented singers and musicians, blending pop and jazz in a completely novel way....Outside the Jukebox takes us inside his unique method."